During the 1850 Federal census taken for District No. 8, Stewart County, TN, Robert Payne Byrd was still living at home with his parents and sisters. His older brother, William Carroll Byrd, had left for Wayne County, MO by that time. Sometime between the 1850 census and his marriage to Mary Catherine Callaway in Arcadia, Iron County, MO on September 25, 1857, Robert Payne Byrd had moved to Missouri. His older brother, William Carroll, lived close-by, near Brunot in Wayne (later Iron) County. Sometime after his marriage, Robert Payne Byrd moved to Fredericktown, in Liberty Township of Madison County, MO; he and his wife Catherine were listed as living here in the Federal census taken on June 14, 1860 (page 55, dwelling #400, family #400). Interestingly, he apparently gave his place of birth as Kentucky rather than the correct Tennessee. His older brother William Carroll Byrd, living near Brunot in now Iron County, MO also gave his place of birth as Kentucky in the 1860 census — perhaps a reflection of the increasing tensions between the Federal government and traditional slave states during this time? Tensions increased as war broke out between North and South; Missouri became the focus of both Confederate and Federal efforts to consolidate their respective territories. An early battle in Missouri occurred at Fredericktown, in Madison County, MO on October 21, 1861 between Missouri State Guards forces led by Brigadier General M. Jeff Thompson and Federal soldiers directed by Colonel Joseph B. Plummer (under overall command of new Brigadier General Ulysses S. Grant stationed in Cairo, Illinois). After the battle, Federal soldiers — led by the 1st Indiana Cavalry — angry at not having been warned by locals in Fredericktown about the ambush successfully executed against them that day, took out their anger on the civilian populace and burned about 12 houses. In addition, all stores in Fredericktown were looted and damaged by rampaging Federal soldiers. Local Negroes, both slave and freemen, were taken away by the vindictive Yankees. What actual impact all of this had on Robert Payne and Catherine Byrd is currently not known; they were undoubtedly aware that Payne’s older brother, William Carroll Byrd, had lost all of his livestock to foraging Federal soldiers sent to Brunot during August, 1861 by then Colonel U.S. Grant in order to punish Southern sympathizers. Another critical factor in Payne deciding to join the Confederate Army may have been the implementation of a series of General Orders by the Federal commanders in Missouri: in June of 1862, General John M. Schofield ordered that a fine of $5,000 be levied on Southern sympathizers for every Federal soldier or pro-Union citizen killed in their vicinity. Then, on July 22, 1862, General Schofield issued General Order No. 19 which ordered all able-bodied Missourians to report for service in the Federal army within six days — thus effectively forcing any neutral Missourians to choose between the Union and the Confederacy. All the above were possible influences on Robert Payne Byrd and his subsequent actions described below. Apparently Robert Payne and Catherine Byrd owned property in the town of Ironton, Iron County, MO as indicated by an Iron County land deed dated July 14, 1862. As recorded in this deed, Payne and Catherine Byrd sold lot No. 5 in block No. 38 of Ironton to a certain Jacob Howel (sic) for the amount of $50. Shortly after that, Robert Payne Byrd traveled south from Ironton to Oregon County, MO where, according to his CSA service records, he was enlisted in Company F of Colonel James White’s 3rd (later 9th) Missouri Infantry, CSA on August 2, 1862 by T.H. Turner. This enlistment may have taken place at CSA Camp Brewer in Oregon County under the aegis of the following members of Co. F: Captain Thomas Lashley, 1st Lieutenant Daniel Lorenius (Lanius? ), 2nd Lieutenant John M Pease, and 3rd Lieutenant Abner Hancock — this info from the CSA pension of Pvt. Richard Callison described below. According to Jerry Ponder, the author of The 9th Missouri Infantry Regiment, C.S.A. and the 12th Missouri Infantry Regiment, C.S.A. (1996), recruitment likely occurred at headquarters established at Fort Currentview on the Missouri – Arkansas border at Pitman Ferry. Again according to Jerry Ponder, a confusing situation arose when Lieutenant-Colonel Willis M. Ponder resigned from White’s 3rd/9th Missouri Infantry during March, 1862 and formed another regiment of his own during July of 1862 — it appears likely that Robert Payne Byrd was in this unit, also called the 9th Missouri Infantry, commanded by Willis M. Ponder. Active training and drills took place at Camp Shaver, near Pocahontas, Randolph County, Arkansas. Ponder’s 9th Missouri Infantry then moved to Izard County, Arkansas during September, 1862 for additional training. During reorganization at Yellville, Arkansas on November 14, 1862, Ponder’s 9th Missouri Infantry was redesignated the 12th Missouri Infantry, C.S.A. A composite muster roll for this unit given by Jerry Ponder (1996) lists Private R.P. Byrd in Co. F, Ponder’s 12th Missouri Infantry; in the same company is listed Captain D.J. Lanius and Privates Richardson Collison (sic) and Jacob Howell — probably the same person who bought the lot in Ironton from Payne and Catherine Byrd. Pvt. Robert Payne Byrd, Co. F, White’s 9th and/or Ponder’s 12th Missouri Infantry may have participated in the bloody Battle of Prairie Grove, Arkansas on December 7, 1862 — his Confederate service records are not clear on this account. It is known, however, that one of the men listed as belonging to his Company F, Pvt. Richard Callison, was badly wounded on that day according to his Missouri State Confederate Pension documents: “I received a gunshot wound in the battle of Prairie Grove, Ark……in my left arm between the wrist and elbow, which fractured one of the bones of my forearm.” Don Montgomery’s history of the Battle of Prairie Grove (1996) describes Lieutenant-Colonel Willis Ponder’s 9th Missouri Infantry as part of Parson’s Brigade in Major-General Thomas C. Hindman’s Army of the Trans-Mississippi. Brigadier General Mosby M. Parson’s brigade was within the 3rd Division of the Army of the Trans-Mississippi, commanded by Brigadier General Daniel M. Frost. On December 7, 1862, Ponder’s 9th Missouri Infantry had approximately 476 men, armed with an assortment of different rifled and smooth-bore muskets. NOTE: underlined italics denote handwriting. Not willing to be exchanged. Examination of R.P. Byrd of Madison County, Missouri. Taken the 11th day of February, 1863. Confined at Gratiot Street Prison. Statement of R.P. 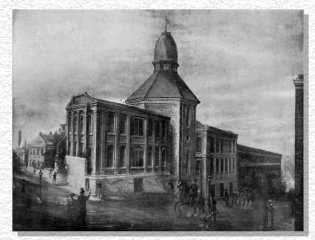 Byrd, a Prisoner at the Gratiot Street Prison, St. Louis, made the 11th day of February, 1863. My age is 30 years. I live in Madison County, Missouri. I was born in Calaway County. I was captured in Oregon County on or about the 29th day of January, 1863. The cause of my surrendering had been with Col. White, Hindman’s command. I joined him voluntarily (sic). I was in arms against the United States, and was a [rank] Private in Capt. Ashley’s* Company, White’s Regiment. I was (blank space here) sworn into the Rebel service about the 6th day of July, 1862 by D. Lanius in Oregon County, Missouri for 3 years or during the War. When surrendered, I was first taken to West Plains and remained there 5 days. Houston and Rolla 1 day and was not examined there by (blank space here) and was sent to Gratiot Prison about the 3 day of February, 1863. I never took the oath of allegiance to the United States, about the (blank space here) day of (blank space here) 186 (blank space here). Subscribed by the Prisoner, the day first named, in my presence. Gun. Been on Picket duty once. 5. Have you ever furnished arms, or ammunition, horse, provisions, or any kind of supplies to any rebels? State when, where and how often. 6. Was there any rebel camp near you, that you did not give notice of to the U.S. troops? 7. Have you ever been with any one taking or pressing horses, arms, or other property? 8. Are you enrolled in the E.M.M. — loyal or disloyal? 9. Are you a southern sympathiser? 10. Do you sincerely desire to have the southern people put down in this war, and the authority of the U.S. Government over them restored? 11. How many slaves have you? 12. Have you a wife — how many children. 13. What is your occupation? 14. What relatives have you in the rebellion? 15. Have you ever been in any Rebel camp? If so, whose — when — where — and how long? What did you do? Did you leave it, or were you captured in it? Yes. White’s. July 1862. Different Places. Seven months. Soldier. I left it, became disatisfied (sic) with the laws of the Southern Confederacy. I do not want to be exchanged. Willing to take the Oath, & give a Bond for $1000. Not willing to enroll. At least some of Pvt. Robert Payne Byrd’s answers in the examination document above are likely examples of what Michael Fellman, author of Inside War, the Guerrilla Conflict in Missouri During the American Civil War (1989), describes as “survival lies” that were used on both sides during the chaos in Missouri between 1861-1865. Payne may have been telling his interrogators what he thought they wanted to hear with hopefully no punishment meted out to him for his answers. His crossed out “Not as much as I was” answer to question No. 9 above suggests there was indeed some coercion by his Federal captors. His answer of being born in Callaway County may have been an attempt to shield his parents back in Stewart County, TN which was then actively occupied by Federal troops stationed nearby at both Ft. Henry and Ft. Donelson. Similarly, he may have been trying to protect his older brother, Pvt. George Wesley Byrd who had served in Co. B (Taylor’s) of the 1st Tennessee Artillery, CSA at Ft. Henry on February 6, 1862. The last notation on his CSA service records states that Pvt. Robert P. Boyd (sic), Co. F, White’s Regt. appears on a monthly report of Gratiot Prison from March 1 to 31, 1863. The last notation reads: “Where captured — Oregon Co. MO. When captured — Jan. 28, 1863. Received — Feb. 8, 1863. Discharged — Mar. 6, 1863. Remarks — Small Pox Hospital.” As best as can be determined at the time of this writing, Payne Byrd contracted smallpox and was removed to the so-called Small Pox Island (McPike’s Island) in the middle of the Mississippi River and offshore from the Alton, Illinois POW camp. It is assumed he died there and was buried in a mass grave with other CSA POWs who died from smallpox at that time. No records yet found indicate exactly when he died or where. Interestingly, the Bible belonging to his father, John Wesley “Jack” Byrd, back in Stewart Co. TN records his death as being on April 7, 1864. The exact date and place of Pvt. Robert Payne Byrd’s death is still unknown to any of his current relatives.